With some certainty, I can attest to have seen both The Maze Runner (2014) and its sequel, Maze Runner: The Scorch Trials (2015)—since I wrote reviews for both. But when faced with the third entry in the Maze Runner trilogy, called Maze Runner: The Death Cure, I’m hard-pressed to remember much about either of its predecessors. After re-reading my reviews, I remember only glimpses, and more from the first movie than the second. The dystopian YA series, based on author James Dashner’s trilogy, began with a promising setup: A group of teens finds themselves delivered to an isolated piece of land surrounded by unclimbable walls. Their only escape appears to be a deadly labyrinth filled with robot spiders and other traps. As it turns out, the maze serves as a laboratory for WCKD (World Catastrophe Killzone Department)—which was high on the list of rejected names for James Bond terrorist organizations. 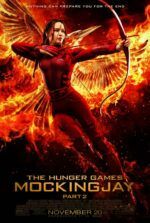 The second movie involved our young heroes, having escaped the maze, aligning with a post-apocalyptic band of ragtag rebels and trying to survive a vast desert populated by zombies and WCKD goons. Does any of this sound familiar to you? Although the first two entries came out one year after another, The Death Cure took three years to reach theaters due to its star, Dylan O’Brien, sustaining an on-set injury while filming a dangerous stunt. During that time, any vested interest began to fade. The Maze Runner movies proved unmemorable, quite literally, as the target teenage demographic began to grow up and forget that, Oh yeah, we never got that third Maze Runner movie. And while the franchise probably should have cut their losses, as the Divergent series did after just three-out-of-four entries, director Wes Ball returns with an $83 million production that will probably just break even at the box-office. Certainly, the prospect of enduring another 142 minutes of Maze Runner universe gave me pause. And why not? Prior to the third movie, the series had yet to explain WCKD’s master plan, beyond stopping the zombie plague, dubbed the Flare. Why is WCKD so, well, wicked? Why have our heroes been subjected to a series of elaborate tests? How does running through a maze stop a zombie plague? Such questions are unimportant next to the YA trope of teens rebelling against stuffy adults. And rebel they do. 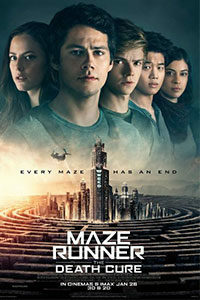 This time around, Thomas (Dylan O’Brien) and his pal Newt (Thomas Brodie-Sangster) join forces with various insurgents, including Jorge (Giancarlo Esposito), Brenda (Rosa Salazar), and their leader, Vince (Barry Pepper), to mount a rescue of their captured friend, Minho (Ki Hong Lee). The opening attempt to save Minho from a WCKD train looks like The Road Warrior territory, complete with John Paesano’s score that sounds suspiciously like Junkie XL’s now-iconic riffs from Mad Max: Fury Road. When Thomas’ crew fails to recover Minho, they resolve to head into “the last city,” a Blade Runner-inspired, walled metropolis that serves as WCKD’s headquarters. It doesn’t take long for someone to point out the irony of breaking into a walled city when they spent so much time trying to break out of a walled maze. Their mission: stop the dreaded WCKD, rescue Minho, and steal the zombie cure from the lead scientist, the turncoat Teresa (Kaya Scodelario). With some suspicious help from yet another rebel leader, this one the noseless half-zombie Lawrence (Walton Goggins), their mission grows complicated by the ever-dressed-in-black Janson (Aidan Gillen), who’s determined to kill Thomas. Ball directed the two earlier movies, and he approaches the third with an improved visual sense (it’s the best-looking of the three movies). Gyula Pados’ lensing has an ugly color palette of grainy browns and drab grays (it’s the post-apocalypse, after all), but the frantic, handheld camerawork of the earlier movies is gone here. Despite the sudden cohesion in his form, Ball’s visual choices evoke some famous cinematic scenes, making The Death Cure distractingly derivate. There’s a shot from inside WCKD’s skyscraper central that looks like the view inside of the Tyrell Corporation in the aforementioned Blade Runner. Another sequence almost replays the scene from Jurassic Park where the children hide from Velociraptors in the kitchen (this statement is misleading; there are not Velociraptors in The Death Cure). The climactic moment at the edge of a platform atop a fiery building, followed by a last-minute rescue by an airborne transport, bears eyebrow-raising similarities to Aliens. And while Ball’s choice of films to draw from remains a personal list of favorites for this critic, it would have been more interesting to see the director use these titles as a springboard instead of a blueprint. 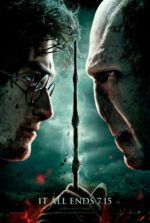 O’Brien remains a convincing leading man but Thomas is a dull protagonist. 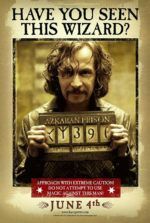 Salazar shines, while the excellent adult supporting cast (including Esposito, Pepper, Gillen, Goggins, Will Poulter, and Patricia Clarkson) is criminally underutilized. The material—adapted by T.S. Nowlin in a screen story that, according to fans anyway, doesn’t resemble the book—proves too hokey, too predictable, too dependent on the familiar melodramatic conflict in which underdogs take up arms against a dominating force. That basic narrative structure has its merits, of course, but it’s been overused in YA franchises (see The Hunger Games, Divergent, Twilight, Ender’s Game, The Giver, The 5th Wave, Eragon, The Seeker: The Dark is Rising, The Host, I Am Number Four, Percy Jackson, City of Ember, and a few dozen others I am forgetting). Both formally and narratively, The Death Cure feels like a patchwork, Frankensteined together from better material. At the very least, Ball has grown as a filmmaker over the course of the series. Perhaps with a better script and less reliance on the films he admires, he may offer us something more memorable in the future.